The field expedient M3A1 ‘Satan’ highlighted a need in the Pacific for a mechanized flamethrower. In the summer of 1944, the Satan, developed by POA-CWS (Pacific Ocean Area-Chemical Warfare Service), had proved its use in the assaults on the Islands of Saipan and Tinian. Their improvised nature, however, meant that they were not without faults. Plans for a light tank based flamethrower pre-date the Satan. The design was for a powerful flamethrowing unit to be installed into the M3A1’s descendant model, the Light Tank M5A1. It would share a similar design process as the M3A1 Satan and would be designated according to its primary weapon, the E7-7 Mechanized Flame Thrower. The M5 was the last in the lineage of light tanks which had followed the same design since the Combat Car M1 which entered service in 1935. First rolling off the production lines in 1942, the M5 was designed to replace the now aging M3. It was originally going to be designated the M4 but, to avoid confusion with the famous Medium Tank, the designation was changed to M5. Overall, the design was similar. It shared the same vertical volute spring suspension (VVSS) and 37mm main gun. The real differences lay with the hull design and engine. The hull was a completely different design but followed elements used on the M3A3. Gone was the stepped armor layout at the front of the tank, replaced by a large sloped plate, granting more effective protection. The idea of mounting a flamethrower on the M5A1 dates back to November 1942. The National Defence Research Committee (NRDC) handed a contract to the Standard Oil Company to develop a new Large-Capacity flamethrower for installation on tanks. This was dubbed the ‘Model Q’, the ‘Q’ standing for ‘Quickie’. This was in the hope that the weapon would be quick and easy to produce. This flamethrower unit was tested successfully in January 1943. This led to the award of another contract to Standard Oil to modify the Model Q to allow it to be mounted in the M5A1. Following traditional Chemical Warfare Service (CWS) naming protocol, the weapon was designated by its component parts. In this case, it was the combination of the E7 fuel tank assembly and the E7 flame gun. The fuel reservoir held 105 US gallons (397 liters) of either standard fuel or napalm-thickened fuel. The system could discharge this flaming liquid at a rate of approximately two gallons (7.5 liters) per second. The standard fuel had a range 30-40 yards, (27-37 meters) while the thickened fuel could be propelled to 105-130 yards (96-119 meters). A number of modifications were made to the turret in order to mount the new weapon. The hydraulic power-traverse systems were moved to the turret bustle, replacing the radio which was moved to the right sponson. Unlike the Satan, which had a limited turret traverse due to the haste in which it was constructed, the E7-7’s turret had a full 360-degree arc of rotation. The flame-throwing equipment accompanying fuel reservoir and compressed gas cylinders replaced the standard equipment in the M5’s turret basket. To grant extra room for some of the flame fuel tanks, the standard conical turret basket was replaced with a cylindrical one. Internal hull storage was altered to allow room for the larger turret floor. A newly rounded mantlet was added, through which the flame-throwing nozzle protruded protected by a cylindrical shroud. The coaxial Browning .30 Cal. (7.62mm) machine gun, mounted on the left of the gun, was retained. 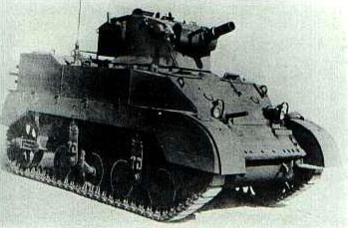 Unlike the standard gun tank, the E7-7 was operated by a crew of just three men. This crew consisted of the commander/gunner in the turret who operated the flamethrower, the driver in the front left and the assistant driver/bow gunner in the front right, who would also operate the newly repositioned radio. ‘Fire Buggy’ and ‘Flaming Fanny’, Luzon, April 1945. These two vehicles are the only E7-7s that we know the given name of. Both illustrations are by Bernard ‘Escodrion’ Baker, funded by our Patreon Campaign. 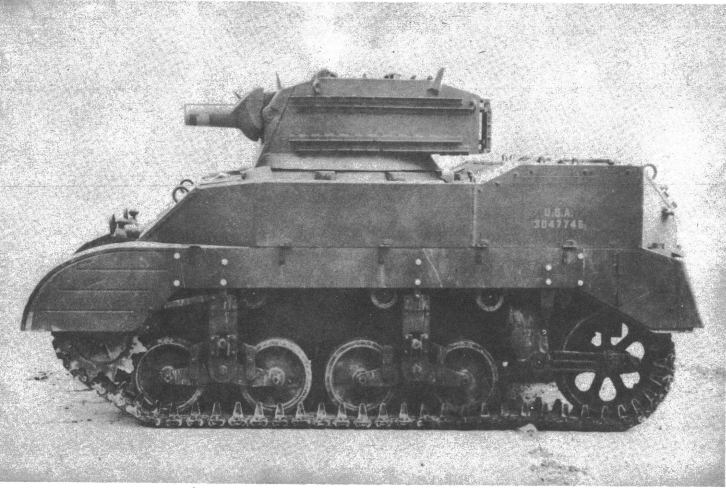 A prototype of the E7-7 was tested in November 1943. This was soon followed by three further pilot vehicles. These were completed by 1944 and would be the only four to come out of the NRDC’s conversion program. By this time, the United States’ Army was losing interest in main armament flamethrowers (flamethrowers that replace the tanks main gun with a flame gun) mounted on light tanks. Light tanks, by this point, had proved obsolete in the War in the Pacific. They were vulnerable to the newer Japanese anti-tank guns such as the Type 1 47mm found on the later versions of the Type 97 Chi-Ha medium tank. As such, mechanized flame thrower development was focussed on medium tanks, namely the M4. 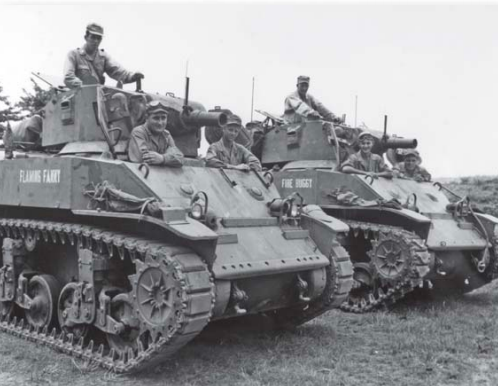 The four vehicles were deployed to the Pacific Ocean Theater (PTO), making them the only flame throwing tanks built on the United States mainland to see combat in the Pacific campaign. They were deployed to Luzon, in the Philippines, as part of the 13th Armored Group Flame Thrower Detachment in April 1945. 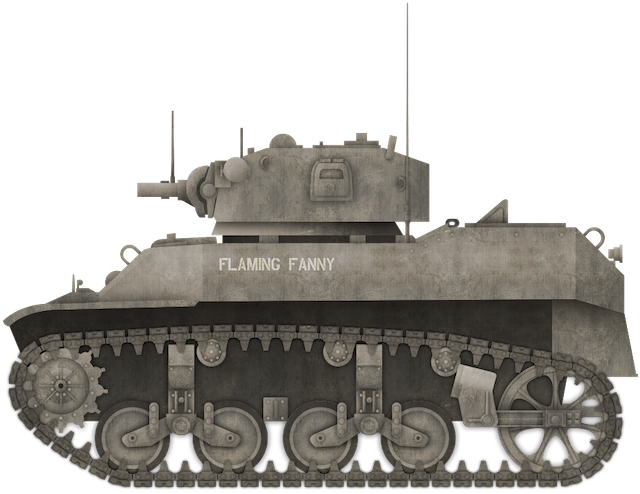 The tanks were all given names beginning with ‘F’, the two known examples being ‘Flaming Fanny’ and ‘Fire Buggy’. During the fighting at Balete Pass, they were assigned to I Corps in support of the 25th Infantry Division. The E7-7s were used against various Japanese targets, including machine gun positions, bunkers and pillboxes. The E7-7s were greatly appreciated by the Infantry units they were supporting. No additional E7-7s were built beside the four already constructed, as medium tanks took precedence as the basis of future mechanized flamethrowers. The fate of the E7-7s are unknown, but none are known to survive today. The E7-7 was not the only M5A1 based flamethrower, though. Another experiment was the E9-9 Mechanized Flamethrower. This was the most powerful auxiliary flamethrower (flamethrower as a secondary weapon, main gun retained) ever constructed. It consisted of a flame gun mounted on the front of the tank, connected to a large trailer which is attached at the rear of the tank. This trailer, which is almost bigger than the tank itself, carried all the fuel (800 gallons worth) and propulsion systems. The system could propel a liquid flame up to 200 yards (183 meters). The E9 only ever saw testing, as a catastrophic accident in May 1944 led to the death of 4 men, which brought a quick end to the project.